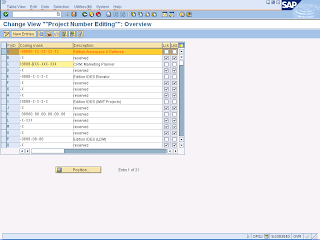 In this SAP PS configuration activity, you create masks for editing the project number using OPSJ transaction code.. Masks help display complex project numbers. They can also be used to indicate the position of a WBS element in the project hierarchy. You can create a mask for every key you want to use in project coding. In addition, you can maintain a block indicator for standard (LkS) and operative (Lck) structures. If you maintain the indicator, you cannot create new projects with this coding key. The project number Z453SKS555ELEK is edited to Z/453-SKS-555/ELEK. The standard system contains a mask for coding for the key “Z”.